Adding a 572 to my collection of Remington rimfires is about the last one (except a 504 of course). My question is how are the recently produced 572's? Do I want a new one, or a vintage one? Anybody bought one in the last year or so new? Opinions? I recently found (and bought) a used 572 (vintage 1991) with a 4X scope. At a price about 1/3 of the new price. Its in great shape, it shoots just as expected. I will usually opt for a good used gun rather than new because of cost. Previously owned guns generally shoot as good a new. Good luck on your search for one. Go for used if you can find one. Should save a wad except at Gun Shows where prices are high and ya gotta haggle. Plus used may have better QC than stuff coming out lately. I did end up finding a used model off GB, vintage 1993 if I recall. Took it to the range yesterday. Needed a cleaning and some lube, but it digested S-L-LR round interchangeably and mixed. Always love a gun that can do that. I have not had the chance to mount a scope yet, but just using the basic iron fixed sights, I was nailing shotgun hulls at 25 yards repeatedly. Gave her a good cleaning and expect many years of fun! Finally got some range time with my 572. I mounted a cheap Barska 3-9x40 scope on it as I had one laying around. I had the opportunity to work our indoor range as RSO on Sunday and since it was an unusually glorious day in SE-AK, we only had one customer. So I got the scope mounted and sighted in at 50-feet (our inside range distance) and it was shooting 3-leaf clover patterns off a sandbag rest. Lots of 3-shot groups looked like 1 ragged hole, just enough to show multiple shots. Using Remington Thunderbolt, the action needed a major cleaning afterwards. But quite the slick lil' rifle. As a kid in the early 70's I would have loved one of these or the 552 that is it's stable-mate now. In fact, I have yet to be disappointed with any of my vintage Remington rimfires. Last edited by Scorpion8 on Tue Jul 24, 2018 10:45 am, edited 1 time in total. Nice report Scorpion. I too have not fired a 572 but did shoot the 552 wayyy back when. Nice heft to those guns. Think they used to come with either walnut or hardwood without the checkering as my friends. mauser9 wrote: Think they used to come with either walnut or hardwood without the checkering as my friends. Mine is a plain hardwood but the pump forend has grip serrations. Long, moderately thick barrels on these. They exude a hand-crafted quality that is missing in today's all-plastic 597's and such. Agreed. Would much rather have a 552 if I decide. Have to admit though I did buy a Ruger Compact 22 magnum with the 18 inch barrel for woods varmint hunting. Light weight and does retain a satin finish for bluing. Ordered the standard stock module for greater length of pull. Quite a blast from that 18 inch barrel in 22 magnum. Liked it because it does not feel chintzy for a synthetic in my opinion. Price was only $279 a couple years back. mauser9 wrote: Price was only $279 a couple years back. I hear ya, it's hard to argue with the pricing, but we're losing the quality. Browning quit making the HiPower because costs were getting so high compared to the number of sales, and you can buy Glock-clones like the S&W SD9VE for $279, injection molded body and all. I have a Ruger 10/22, but it's just not the same "quality" in my book as any number of other rimfires. I also ordered a Ruger American Rimfire in 22 Mag when they first came out but sold it off quickly as it just wasn't my "style". The plastic stock just exuded an atmosphere of "cheesy". I feel what you're saying about the quality of a lot of newer guns. They just don't hold up to the classics. In my case, I bought a 10/22 last winter. It took me that long to stop holding a grudge to Bill Ruger years after he died before I started buying anything associated with him again after the AWB fiasco. Anyway, the 10/22 that I bought had a wooden stock, but dang if it wasn't soft wood. It would dent and ding if you looked at it wrong. 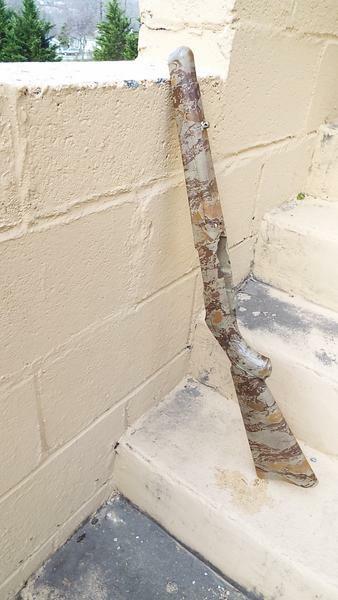 So, I bought a plastic stock, did a water camo dip in my favorite pattern and sold the original stock on ebay for the cost I had in the other stock. While I appreciate a nice wooden stock, Ruger missed that memo. The plastic stock was an improvement sadly. If you can plink shotgun hulls at 25 yards, that's plenty accurate enough for putting food on the table. Congratulations. Looks pretty good John. Took me a while to warm up to synthetics but admit they have their place. I have read the price of Black and Claro walnut is through the roof these days. Makes my older Model 700 with walnut stock seem like a high end gun today when just ho-hum when I bought it long ago. Will keep searching for that 552. Nah, I hear ya. I have a 10/22, my 3rd actually. Sold the first two as those dang rotary magazines hate me, or I hate them. But eventually figured if I'm going to be a rimfire guy, ya gotta have one. Mine has the hardwood stock too. As far as Ruger plastic stocks go, the "boat paddle" was at least functional if not too noisy. The newer ones seem to be like cheap hollow-core doors - just strong enough to do the job. Send me your project info John, never too busy for a friend.